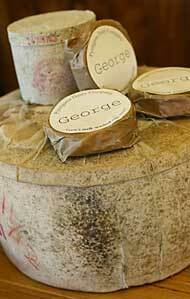 George, a washed-rind cheese named after the river running through the valley, is not currently on the market, but there are plans to bring it back. A soft, washed-rind cheese demands much attention, but takes only four to six weeks to mature, giving a much quicker return on the milk, and every 10 litres of milk it takes to produce a kilogram of cheddar can result in 1.8kg of George. Traditiona plays an important part in cheesemaking at Pyengana, and artifacts from the past are often seen in the factory. THE SWISS TOUCH: A taste of cheesemaking, small-farmhouse style. By WILLIE SIMPSON | A remarkable cheese with a history that dates back four generations is still made the same way today. Jon Healey, a fourth generation dairy farmer/cheesemaker from Tasmania’s far north-east, has carried on a proud family tradition with the Pyengana Cheese Factory, which he opened in 1992 as a mere 23-year-old. Both Healey’s grandfather and great-grandfather made cheese in the tiny Pyengana Valley — the tradition skipped a generation with father John. 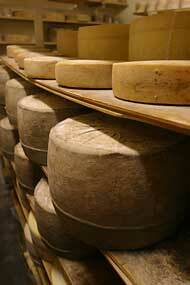 There has been a history of English-style cheddar making in this area for about 100 years. It’s always been the same style of cheese — a stirred-curd cheddar wrapped in cheesecloth. Cheesemaking in the area eventually petered out in the 1980s. In a wonderful piece of historical symmetry, Healey recently acquired from a neighbouring property some equipment which originally belonged to his grandfather — a 500-gallon (2,400 litre) cheese vat built in 1950. Designed to make this type of cheese, it was still in perfect condition. The youngest of five children, Jon was bitten by the cheesemaking bug at 16 after the family were advised to value-add to their dairy farm. He finished a dairy-farming apprenticeship in Burnie Agricultural College but was unable to find an opening in the cheesemaking industry. Older brother Gavin, a professional golfer living in Switzerland, arranged for the teenage Jon to learn cheesemaking at a tiny farmhouse operation in that country. He returned home and took an intensive course at the Gilbert Chandler Agricultural College in Victoria and then began plans for his own concern, building a factory with the help of builder brother, Simon. Today Healey makes his acclaimed Pyengana clothbound cheddar pretty much as his great-grand-daddy did before him. He still uses a wood-fired boiler to heat the milk. 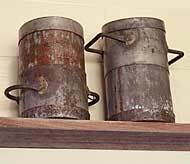 “You can make a whole batch of cheese with a barrowful of wood,” he says. Wood is pretty cheap in this neck of the woods and Healey likes the idea that the smoking chimney tells people when a batch of cheese is being made. The busy Pyengana Cheese Factory shop sells about three tonnes of cheese a year. The clothbound cheddar is available in 1.2kg, 2.5kg, 4.5kg, 7kg and 18.5kg wheels or smaller packs which include various herb and spice ingredients like chilli, garlic, peppercorn and carraway seeds. The Factory Shop in Pyengana is open seven days a week and advertises “the best milkshakes in Australia” as well as various sidelines made by Healey family members. Sister Lee (a potter) supplies cow logo mugs, another sister Karyn makes biscuits and coconut ice, while a tasty tangelo paste (a perfect accompaniment to Pyengana cheddar) is made by Healey’s wife Lyndall’s aunt. Father John is back in the cheese business, helping along with Lyndall's parents, Brian and Helen, in the factory and shop as required. The cheese factory was built by Jon Healey and his builder brother. There are plans for bigger better things when time and money permit. Healey plans to double Pyengana’s current annual output of around 33 tonnes. While the clothbound cheddar will remain the flagship, there is also on offer a washed rind, surface-ripened soft cheese with a lot of flavour that matures in six weeks. Look too for a more traditional ‘chip’ cheddar. 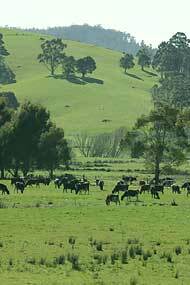 What is it about northern Tasmania that keeps producing award-winning cheeses? Pyengana cheddar wins so many awards, Jon Healey doesn’t have time to frame and mount them all. Meanwhile, Heidi Farm gruyère is a past winner of the Good Living Australian Cheese Awards and a Bodalla aged cheddar (from United Milk Tasmania’s Wynyard plant) eclipsed a field of 1,025 entries in the 2000 World Championship Cheese Contest in the United States. And the list goes on.